Dealing with the same topic of lackluster cash relevance in banks, this article is more sensational, but no less important. Just as Sweden is making the shift to electronic currency over cash, Russia is making U.S. Treasury securities disappear. According to an official U.S. Treasury report issued July 18, holdings of U.S. Treasury securities plunged 84% between March and May, from $96.1 billion to $14.9 billion. At that rate of decline, the rest may be gone already. The backstory is unclear (typical of Russia), yet the most likely explanation is that Putin was preparing for his early June Helsinki Summit with Trump by reducing his dependence on U.S. creditworthiness. Moving the same securities to non-transparent offshore accounts in the Caymans is another possibility. It’s hard to tell. This motivational mystery may persist, but the story is on the front pages. 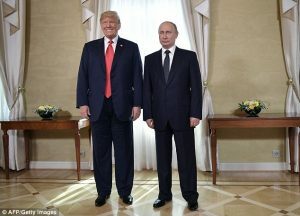 Trump can impose all the sanctions on Russia he wants, but Putin can wave them off by dumping Treasuries and reallocating assets to gold. The two leaders may be chatting, but this story rips back the curtain and shows us what’s going on backstage. The Trump v. Putin saga has a long way to run.